Outlook Conversion tool allows the users to change PST to .txt which is the plain text file format. PST Converter utility helps to transform PST to RTF (Rich Text Format) which is basically a document file type. Using the MS Outlook Converter Software, Outlook PST files can be changed to Hypertext Markup Language (.html) and thus the PST file data could be accessed using web browsers. 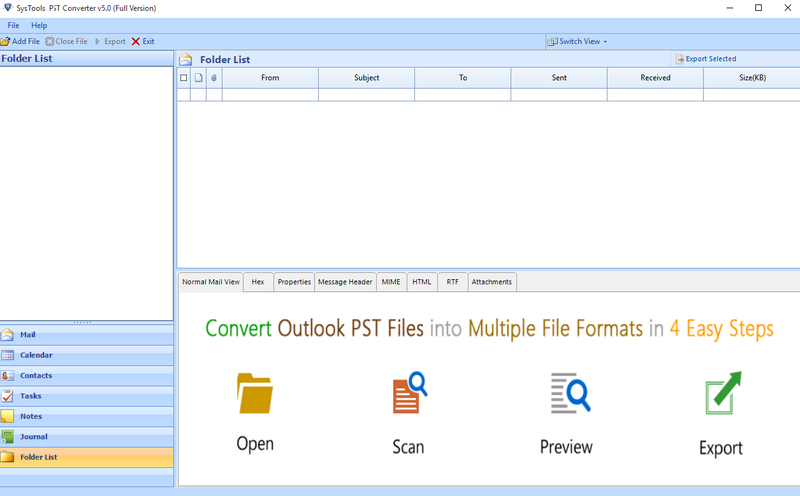 Outlook PST Conversion tool supports the conversion of PST to MHT file format. MHT is a web page archive format, also known as MHTML (MIME HTML). Preview Outlook: Mail, Calendar, Contacts, Task, Notes, Journal, etc. Email Applications: Microsoft Outlook, Mozilla Thunderbird, Lotus Notes etc. Web Based Email Clients: Gmail, Yahoo, Outlook.com, Hotmail, etc. Cloud: G Suite, Office 365, iCloud, etc. Mobile Devices: Android, Windows, iOS, etc. SysTools PST Converter is an effective solution which has got excellence in transferring damaged as well as password protected PST files. Also, the software provides an option to convert PST to MSG, EML, VCF, TXT, RTF, MHT, DOC, DOCX & HTML format. It is supported in Windows OS and also has option to convert both Unicode and ANSI PST files. 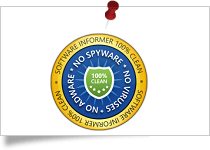 Software Informer gives SysTools PST Converter Software 100% clean and secure award for its great performance. Softpedia provides SysTools PST Converter 100% clean award for offering Virus free software. 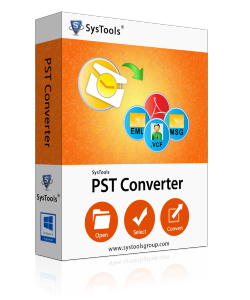 SysTools Outlook PST Conversion Tool gets 5 star rating from CNET for its amazing working. 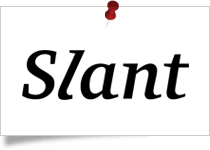 Slant gives SysTools PST File Converter a 5 star rating for its user-friendly behaviour and fast processing. 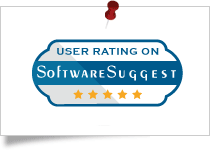 SoftwareSuggest states that SysTools PST File Converter is the recommended software among other applications for its efficient performance. MS Outlook PST file converter allows you to convert all or selective items from an Outlook.pst file. This may include items like: emails, contacts, calendars, tasks, notes, custom folder items into several file formats, which can further be used accordingly. PST file data can be converted using Single mode as well as Bulk Mode. Bulk mode allows to export multiple PST files in batch to RTF, HTML, MHT, EML, , VCF, TXT,DOC, DOCX etc. without any data loss. The PST to EML or converter gives an option to convert the MS Outlook PST file emails into EML or file formats. As EML is a format supported by multiple other emailing applications like: Windows Mail, Windows Live Mail, Outlook Express etc. ; you can easily open it in any of them. On the other hand, file can be moved into any MS Outlook profile. You can create individual Portable Document file for each email items present within MS Outlook PST file. 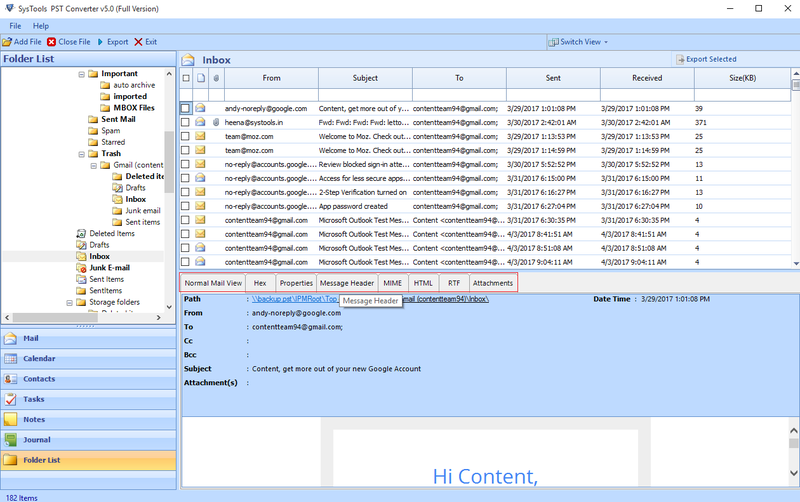 Outlook PST File Converter software will embed attachments of the email within the same Portable Document Format, while converting. With this, a header option is also available through which email header can also be exported. You need to check / uncheck the Include Internet header option to enable or disable it respectively. With the help of PST file converter, it is possible to convert all of your Outlook PST contacts as VCF. VCF is an electronic business card supported by a number of applications and devices. The PST File converter software will create single VCF file for all the contacts present in Outlook address book. Every time you start the Outlook pst converter software, an advanced prompt screen will appear. You can proceed using the software in three different ways; Buy the PST to /EML Conversion software license, Activate the purchased software, or Continue with the demo. MS Outlook PST file conversion tool allows you to export or convert selective PST file items. If you want to save only some folders of your scanned PST file then simply check that particular item and software will export it. Alternatively, all the items will get converted in batch. MS Outlook PST file conversion tool quickly scans the PST file contents and loads all the item folders present in it. Once you click on any of the items, it will load the content and generate an instant preview of it. Attributes are also included like: Subject, location, start, end, calendar recurrence pattern, categories, email addresses, phone numbers, mail sent date & received date etc. While saving the files using Outlook Conversion tool, you can choose an appropriate file naming convention. By default, each file will be saved by the mail subject and if you like; you can change the naming pattern to Subject +Date (DD-MM-YY), Date (MM-DD-YYYY) + Subject + from, etc. During email export, the MS Outlook file Conversion utility offers email filter option for selected data export to be performed. By mentioning a preferred date range of "from" and "to", you can make the software, filter emails based on the selected date. The Microsoft Outlook Conversion software comes with a user friendly interface that resembles Microsoft Outlook UI. Similar to an MS Outlook interface, the software UI features a left panel with a tree structure view of the folders and a preview panel on the right side. Trial version of PST Converter software preview all the PST items & Export 25 items per folder. Can you please explain the working of the software? First, Launch PST Converter and click on Add File. Browse the PST file from the appeared window. Now, select a PST file from the Explorer Window. Click on Add File and the PST file will be scanned. A preview of emails along with attachments will be generated. Click on Export button to export emails. Now, select the resultant file format from the window. Choose a destination location and click Export button to export files. An export report will be generated at last. Go to the destination location to access the exported files. Yes, PST to EML converter is compatible with Windows 10 and all below windows versions. Can I convert my Outlook emails to Portable Document Format? 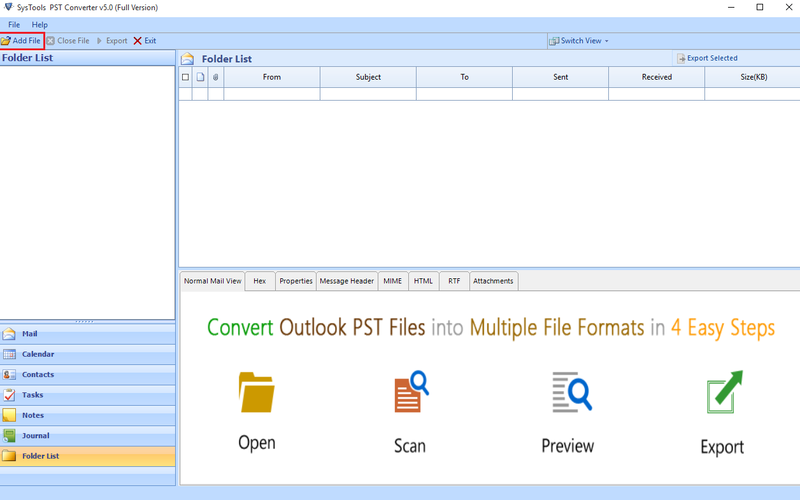 Yes, Outlook PST file converter software can convert emails, contacts, calendars, tasks and other data items of a PST file into EML, Portable Document and VCF formats respectively. How can I see attachments of my Outlook email after converting it to Portable Document Format? Email attachments will be embedded within Portable Document in their original formats. You can see them by clicking on the "Paper Clip" icon within the respective Portable Document file and download them. Do I need to have Outlook or any other application installed on my machine to run this Outlook file Converter tool? No, PST Converter is a standalone tool and does not require Outlook or any other application environment in support. It works without any issues whether Outlook is / isn't installed. Can I export PST to file type using Outlook PST Conversion tool? Yes, this advanced PST Converter tool convert PST to file type. 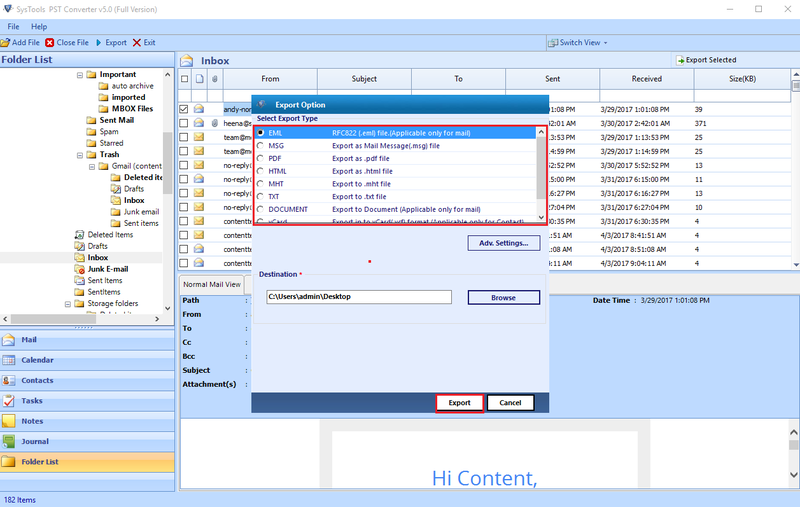 While conversion, the software will automatically export the Outlook data items to in its respective folders. Can I perform bulk PST file conversion using this PST to EML Converter software? No, you can add only one PST file at a time. However, PST files can be of any size. There is no size related limitation within the tool. Does the software support ANSI PST file? Yes, software supports both ANSI as well as UNICODE format of PST file. It can even convert an orphan PST file. Does Outlook Conversion software also convert corrupt or password protected PST file? Yes, the Advanced PST Converter is a highly efficient tool. It will recover corrupt / password protected PST file with the same level of effortlessness and perfection offered. Does software impose any file size limitation on PST for conversion? No, there is no such limitation imposed by the software. It can convert any size of PST file successfully irrespective of its size or format i.e. ANSI or UNICODE PST. Does the Outlook Conversion software make any changes to the original PST file after conversion? No, software doesn't reflect any changes in the original PST file. All contents of PST file will be same as before. Also moves Outlook contacts & calendars into file formats. Add File: It allows users to add single or multiple PST files to the software. Add Folder: It allows users to add multiple PST files in batch. This will add a complete folder containing multiple PST files in it. : Using this option, a user can convert PST to on Mac OS X. It will create a separate file for each folder in PST file. EML : It allows users to convert PST to EML on Mac machine and access it on any of the supporting email application. : If a user wants can convert Mac PST to format also in just a few number of clicks. 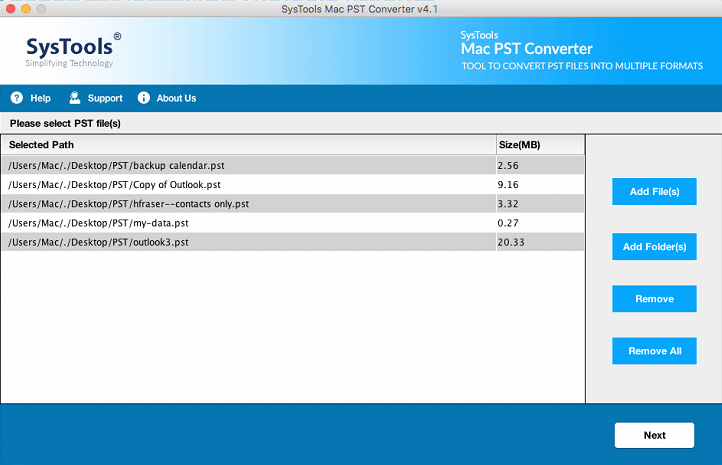 : Permit users to convert Outlook PST to format for Mac. It will create a separate file for each email in Mac PST. : This option allows users to convert PST emails, contacts, & calendars into format. Add Folder: In order to add multiple PST files in batch, a user can use this option. This will add a complete folder containing multiple PST files in it. 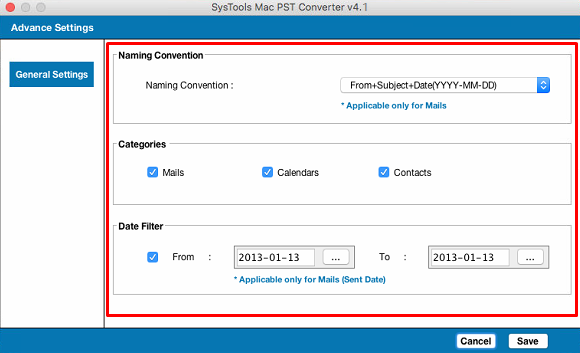 Users can easily view the Outlook contacts to VCF and calendars into ICS using Mac PST Converter. Input the orphan PST file into the utility and go for any of the option: EML, EMLX, MBOX, you will can see your contacts and calendars into respective formats. The software converts unlimited contacts and calendars into the desired formats. While exporting emails from Mac PST files, the Mac PST Converter software provides a date-based filter option. A user can use this feature to convert emails of specified date range from Mac PST to / EML/ and format. The software will export emails, which comes under the specified date range in "To" and "From" field. While converting Mac PST file to EML, , format, the PST Converter for Mac software offers multiple naming conventions to save the file. By default, the software will save it by the subject of the email. If a user wants, can change the naming pattern and select any desired naming convention. For example, subject, AutoIncrement, Subject+Date (DD-MM-YYYY), Date(YYYY-MM-DD)+From+Subject, etc. 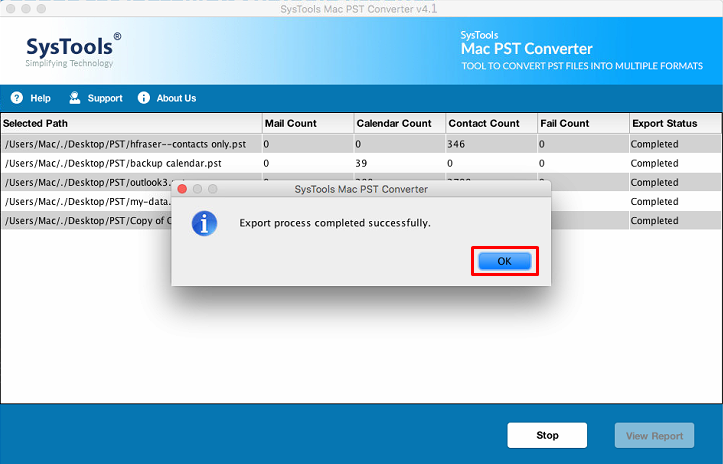 After a successful conversion of PST to , EML, , on Mac OS X, the Mac PST Converter tool will generate a report of the complete export process. This report will maintain all details of the conversion process like Selected Path, Destination Path, Mail Count, Fail Count & Export Status etc. If a user wants, then he or she can save it in CSV format on the local machine for future reference. The another impressive facility offered by Mac PST to Converter is that it provides preserve Maintain folder hierarchy option. If a user wants, can check this option and preserve the on-disk folder hierarchy. Otherwise, it will create a single folder for all emails stored in Mac PST file. 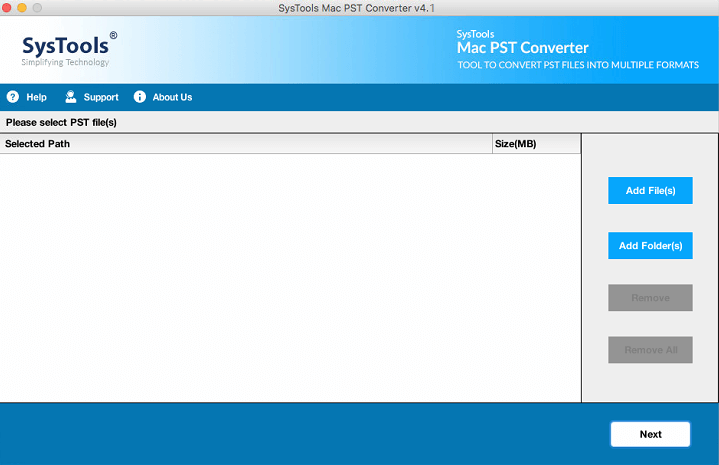 The Mac PST Converter tool is designed in such a manner that it supports Mac OS X 10.8 and all above versions. These editions are - Mac OS 10.8 (Mountain Lion), 10.9 (Mavericks), Mac OS 10.10 (Yosemite), 10.11 (El Capitan),10.12 (Sierra), 10.13 (High Sierra). Trial version of PST Converter for Mac software will export only 100 mail & 25 other items per PST file. 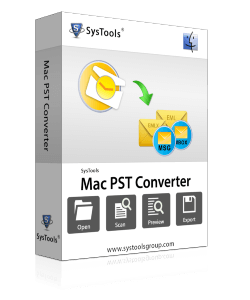 How this SysTools Mac PST Converter Software works? Does the PST Converter for Mac software support conversion of corrupt Mac PST file also? Can I install or run this software on the latest version of Mac OS X 10.13? Is it possible to convert multiple PST file to format on Mac in batch using this PST to Converter for Mac? Yes, with the help of Add folder option, a user can easily add multiple PST file at once on Mac machine. It will upload a complete folder containing multiple PST files in it and export them to the desired format. Does this PST to EML Converter for Mac OS impose any PST file size limitation during conversion? No, this PST Converter for Mac application does not impose any file size limitation during PST file to EML conversion process. Can I save emails from Mac PST of a particular Date Range in EML File Format? Yes, a user can easily save emails of PST File to EML within particular Date Range by Applying Date Filter of specified date range in "To" and "From" field. Though I was quite satisfied with the way my Outlook and its PST had been working. But some legal requirements made me look for a solution to convert a couple of my emails to Portable Document Format. Thankfully SysTools PST Converter was available at my rescue! Thank you guys! Despite of the fact that Outlook stores its contacts in VCF format, I was facing a lot of trouble taking out around 200 contacts. Doing the process manually meant I had to open each contact individually and save them. Evidently I didn‘t have that much time in hand and luckily got the best PST Converter tool! I was looking for a PST to conversion tool. Luckily I found the SysTools PST Converter software. Also I was amazed by that this tool can also convert PST to EML files. This came in as a surprise to me.. Absolutely satisfied Thanks SysTools!! A great bang for your buck!!! This PST file converter software is simply amazing. This supports multiple extensions for file conversion. This can fulfill the characteristics of both PST to VCF & PST to EML conversion. I was concerned to buy different software for each of these converters respectively. Saved my Money. The support department of your company deserves round of applause because other day when I was stuck with issues while converting PST to HTML, one of your support executives handled my queries and provide me the apt answers. Thanks for saving my crucial time. Outlook Conversion helped me with something that I didn't even think was possible in the first place. I am highly satisfied with the way it smoothly converted all my messages from PST to TXT format file. Archiving was never so easy & I got so many other conversion options along with it.. The naming convention feature of this tool is the best part that I like. After using this feature, it becomes so easy for me to manage all my emails. Thanks to this Mac PST to Converter tool for helping me in such a great way. I always like the products by SysTools. Hope to see some more amazing products by you in future. I tried this Mac PST Converter software and I must say that it is the most simple and easy-to-use application for Mac machine. The user interface of the PST Converter for Mac application is self-explanatory. It does not require any expert help to run the application. According to me, a really good effort was done by the developers.